Salaat is only valid if done within its proper time. Once the time period for a particular Salaat starts, it is preferable to do it as early in that time period as possible—however, the Salaat will be valid as long as it is completed within that period. If, for some completely unavoidable reason, you miss a Salaat, then you should pray it as soon as possible. Also see the video on the right. This will be available from your local mosque or you can print it by visiting http://www.islamicity.com/prayerTimes/ and putting in your zipcode. 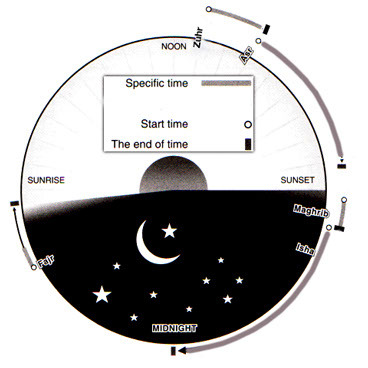 You can determine the time for the prayer by using the position of the sun. It starts when the sun begins to decline from its zenith and ends when the the size of an object's shadow is equal to the objects size. It starts when an object's shadow is equal to the objects size and ends when just before sunset. It is better to pray Asr before the sky becomes yellow. 4. magh.rib (The Sunset Prayer ) .